Alexander Fehling as Johann Radmann. Photo by Heike Ullrich, Courtesy of Sony Pictures Classics / Mongrel Media. The horrors of the Holocaust are so many that they’ll never cease to tell compelling stories. One has to hand it to the Germans for consistently acknowledging this dark chapter of their nation’s past. It’s no wonder, then, that Labyrinth of Lies, a film tackles the choice to make the Holocaust a collective responsibility among Germans, this the country’s official submission for Best Foreign Language Film in this year’s Academy Awards race. (The superior Phoenix is ineligible due to release dates.) This well-mounted drama from director Giulio Ricciarelli is an impressive feature debut that puts history on trial as one man seeks the truth. 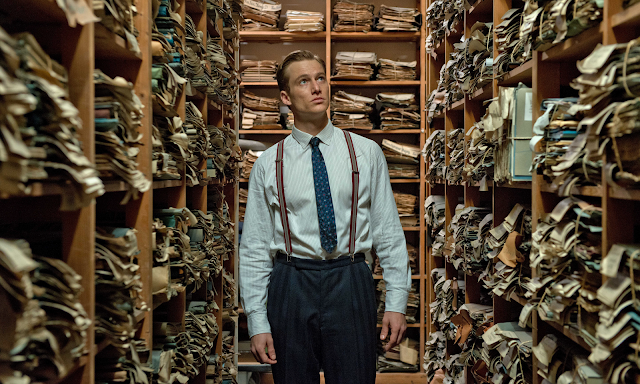 Labyrinth of Lies dramatizes the true story of a landmark case that rounded up not the usual suspects, but dozens of Germans who contributed to the mass killings at Auschwitz with their ever day actions. The film puts ambitious prosecutor Johann Radmann (Alexander Fehling) on an eye-opening investigation as one Holocaust survivor spots a camp guard teaching schoolchildren, and goes to the police for justice. This prompts a chilling question from the prosecutor: Just what, exactly, is Auschwitz? This ornately shot and slickly designed drama presents history objectively and humanely, but Labyrinth of Lies also represents history safely. The film tells audiences about the incalculable crimes of the Holocaust as ample montages feature witnesses giving testimony with grave reaction shots from a stenographer, and the film somewhat rests on the laurels of its true story. However, it’s a great and heroic story worth telling. The screenplay by Elisabeth Bartel simply, but smartly, parallels Radmann’s personal unveiling of ignorance with the larger collective awakening to the truths of Nazism as the prosecutor enlists countless survivors to bear witness to the daily horrors of Auschwitz. Some of the stories are familiar, like those outlining the nightmarish work of the notorious Dr. Mengele (whose own story was recently dramatized in The German Doctor). Anything from checking off a list to following orders is grounds for prosecution, and deservedly so, as Radmann’s case compellingly argues that the toll of the death camps is a collective responsibility, and one created by malice, seemingly mundane actions, and willful blindness. Labyrinth of Lies offers strong thematic nods to Hannah Arendt as Radmann’s case puts the banality of evil on trial. The film asks to what extent orders, or a sense of duty, hold against crimes of greater moral, ethical, and legal stature. The film makes a strong case that any action that contributes to the death, harm, violation, or degradation of another human being bears a burden of culpability and moral responsibility even if said action is inaction. In this regard, though, Labyrinth of Lies covers similar terrain as Stephen Daldry’s vastly superior The Reader as Radmann’s straightforward procedural sidesteps the profound philosophical questions that make the trial of Kate Winslet’s Hanna Schmitz so emotionally and philosophically profound. Labyrinth of Lies lacks the vital element that makes film like The Reader so crucially powerful: an everyday villain. Labyrinth of Lies offers a collective villain in the character of Germany complacency, but Radmann needs to confront his own monster. The film suffers from Radmann’s own unshakable earnestness and one can’t help but watch and wait for him to face the same central question that Hanna asks to make The Reader so unsettling: “What would you have done?” Like Hanna’s former lover Michael does as he hears details of Hanna’s crimes mirror her own power over him—moves with which he was enthrallingly seduced—and realizes the ease with which one steps from the side of good to the side of evil, her question makes one confront a moral abyss for which there are no easy answers. To answer simply is to simplify a context of profound complexity—and one which none of us can ever fully understand. Labyrinth of Lies is currently playing in Ottawa at The ByTowne.